1. If your head hurts, but London looks like this, you probably just have a regular headache. But a migraine might be on its way if London is doing this. And if sickening chunks of pulstating neon tartan are obscuring important historical landmarks, go to bed immediately. Around 15% of migraines start with visual disturbances called ‘aura’, which can seriously affect your ability to see. Some people even go temporarily blind. NB: migraines don’t just occur in London. Then again, you might be one of those people that gets migraine auras without any pain at all and just walk around with a light show dancing across your retinas. In which case, once they start developing apps for the cerebral cortex, your Instagram feed is going to be amazing. 2. With regular headaches, you don’t suddenly get stupider four hours earlier. But migraines are often preceded by extreme tiredness, cravings, crankiness and cognitive problems. For many people, these are useful signs that they should batten down the hatches. For others, including the author, these symptoms just signify that it's Tuesday. 3. Regular headaches don’t turn you into Nosferatu. Bright and even moderate light can can aggravate the bit of your brain that's active during a migraine, which means that I am perfectly within my rights to wear these sunglasses indoors and do not by any stretch of the imagination look like a knobend. 4. In a normal headache, the blood vessels in your brain narrow. With migraines, they dilate. Also, the tissues surrounding your brain swells up, so your hat might feel a little snug. 5. Regular headaches don’t cause severe pain. At least they shouldn't. If you're experiencing a festival of intense throbbing on one side of your head, it's probably a migraine. See your doctor. 6. You can’t get a regular headache in your stomach. But if you have a nauseous stomach ache that lasts between one and 72 hours, guess what? It might be an abdominal migraine, because apparently these exist, too. 7. Regular headaches don’t make your stomach stop working. Migraines slow digestive processes, so people with migraines need to take their medicine as soon as possible - before they're even sure it's definitely a migraine - in case their stomachs stop absorbing food. 8. No one really knows what causes migraines. Could be too much sleep. Could be too little. Could be chocolate, stress, gluten, coffee, Colin Farrell movies, or this sleepy bunny. Science doesn't know. 9. Regular headaches don’t make you vomit and then immediately need to sleep. Only migraines and cheap cider do this. 10. The World Health Organisation doesn’t consider regular headaches as ‘disabling’. But it lists severe migraine among disabling illnesses such as dementia and quadriplegia. 12. Regular headaches don’t give you week-long hangovers. Again, only migraine and cheap cider can do this. Although cheap cider doesn't make you sit through eight repeats of Gossip Girl with a hot water bottle clamped to your shoulder blades. Migraines aren’t regular headaches. If someone you know has a migraine, make sure they take their medicine, then put them in a taxi immediately so they can sleep it off. If you are present during the migraine you may bring them ice for their head and a bucket for the inevitable, and then you must LEAVE THEM ALONE. 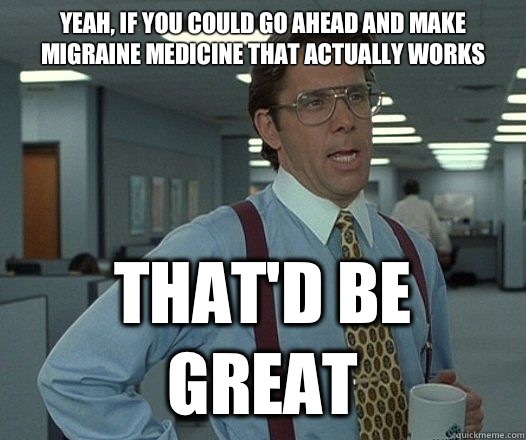 Obviously if you think you're having migraines - or even if you're having too many headaches - see your doctor. This is a regular headache. See you in a week or whatever.